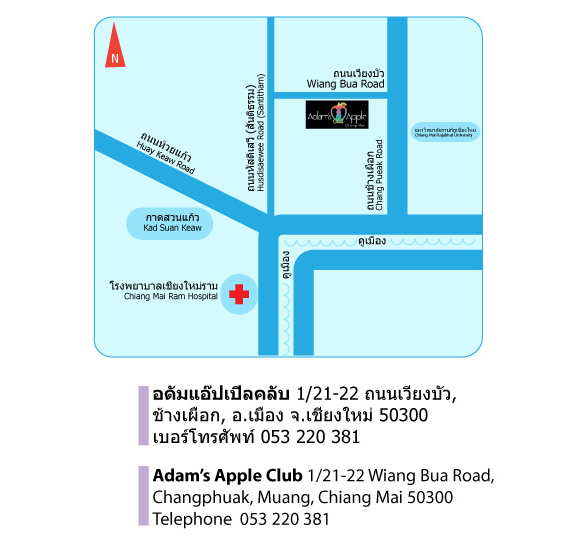 One off the famous Gay Places in Chiang Mai is Adam’s Apple Club, located in the north of the city center. Adam’s Apple Club is one of Thailand’s oldest Gay Go-Go Bars and the best known Gay Bar in Chiang Mai. The club is located on Viangbua Road in Chiang Mai’s Chang Puak district to the north of the city center. The Gay Club boasts an ultra-modern design and is immaculately clean with one of the best sound and lighting systems around. Its discreet entranceway and upstairs location ensure the maximum of privacy. Plush sofas are positioned around the stage to ensure the maximum comfort whilst enjoying a perfect view of the show and a catwalk for the dancers ensures maximum interaction with the audience. Efficient air conditioning and spotless contemporary wash rooms complete the experience. You have to visit this unique Gay Place in Chiang Mai! Our fully stocked Gay Bar offers a selection of delicious cocktails, ice cold beers whiskies, wine and soft drinks. Free popcorn is also available.